In the 1930'a Beverly and Rubye Osborne were driving west from Oklahoma to California. They had no reason to be joyful. They were middle aged and the Depression had wiped out their savings. On this particular afternoon it seemed that everyone in the state was attempting to escape the famine of the Oklahoma dust bowl. With a basket of fried chicken, Beverly Osborne coaxed his Ford pickup across the barren prairie. Suddenly, a bump in the rutted road scattered the chicken and basket. Picking it up, Rubye complained "this is really Chicken in the Rough®." With that chance remark, a fortune was born. Beverly turned his truck around and headed back home. A man who, on instinct, had made a modest fortune and lost it - Beverly reasoned that "fingers were made before forks" and that chicken could be a cheap source of food at a time when incomes were sparse. 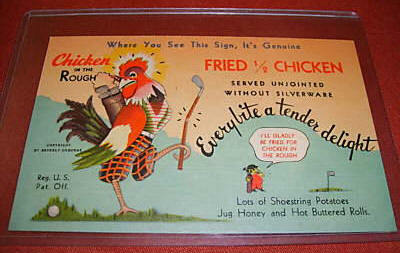 "Chicken in the Rough" logo of a colorful rooster wearing a 1930s-style golfer vest and knickers, swinging a golfclub with one leg and carrying a set of golfclubs on his back. Osborne paid a commericalist $7.50 to create a "Chicken in the Rough" trademark. 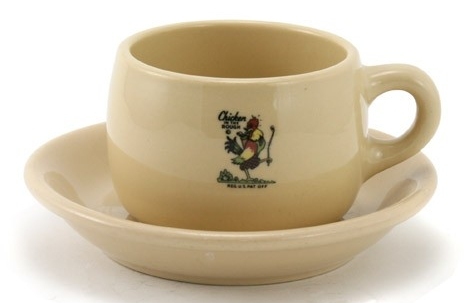 This cup and saucer are from a restaurant chain called the Chicken in the Rough. They once had restaurants all over the US, including several located on historic Route 66 [Oklahoma]. The chain was founded in 1936 by Beverly and Rubye Osborne. Chicken in the Rough, national fried chicken franchise originated in Oklahoma City was sold Sunday. Beverly Osborne, who copyrighted the name and began using it in 1936, declined to reveal the sale price. He said franchise rights were purchased by A. H. "Pete" Crow, Nashville, one-time executive vice president of the McDonald hamburger chain. As a youth, Osborne worked as a shoe shine boy, dishwasher and soda jerk in Marlow. He and his wife, Rubye came to Oklahoma City during the depression with $322 and bought Hunt's Waffle Shop on Main Street. They had to borrow money on his wife's wedding ring and their car and later $15 from the milkman in charge. The Osbornes acquired several small restaurants in Oklahoma City, but were forced by the depression to close them, one by one. Date:1979 Mar 18; Section:None; Page Number: 178 - good article - hard to read part missing on left side - also photo of?? When I drove down Northwest Expressway on a morning last week, Beverly's Pancake Corner stood in its familiar space near Pennsylvania Avenue. When I went back that evening, it lay in pieces on the ground, with bulldozers and other weapons of restaurant destruction looming over its remains. That quickly, it was gone. I hadn't eaten there very often in recent years, but suddenly I missed it, in the way that we miss things we can't have but might want someday. So I went on down the street to the new place called Beverly's, the latest incarnation of that legendary business. It's a fine restaurant, with some throwbacks to the old Beverly's, but well on the way to setting its own style, menu and identity. Still, nostalgia smacked me like a stack of pancakes, so I'm thinking I must have brought the memories in with me, and it's not so much Beverly's that grew up and changed, but me. It was a local legend, years ago. Everybody knew the story of Beverly Osborne and his Chicken in the Rough dreams, and how it was famous up and down Route 66. The logo is still a favored feature of retrospect on the Mother Road. To those of us who lived close enough to get to a Beverly's without getting onto a cross-country highway, it was part of our environment, and a rather exotic part, at that. When I was in college and had a summer job at a shop downtown, we walked, several days a week, to the downtown Beverly's, sat on a stool and had a Bev Burger or a big salad for lunch. We felt pretty uptown in the downtown location. Later, there were late-night meetings with a girlfriend at the NW 23 and Classen spot, where we addressed our personal soap opera plots over endless cups of coffee and pie with rum-raisin sauce. Anyone who's ever been there remembers the little metal buckets that came with an order of fried chicken . Those of us who knew those were finger bowls, which made eating one's drumstick with one's fingers acceptable, felt much more sophisticated than those who puzzled over them and then drank the water. Thus, we learned highway diner etiquette. I didn't see any finger buckets this time. Elegance may have given way to antibacterial, grease-defying finger wash. The old Beverly's never heard of wraps, but the new place carries over melts and stacks and banana splits to a sound track of Sixties songs. A classic, sassy waitress greeted me this time, and said, "Honey, I love you," when I gave her my order simply and easily. She hugged a few customers and spread a dry, maternal fussing over their lunches. It's nice to be loved in a place that serves nostalgia with the meatloaf special. I'm sure some of the customers in there that day were building their own memories of the new adventures of old Beverly's. Myra Woodside is even further proof that the history of our state, only a century old, lies close to the surface. She responded to the column (Jan. 15) about Zeno Beemblossom and Bean Blossom Drive in northeast Oklahoma City.
" In Ken's latest book, 'More Oklahoma Renegades,' they reprinted Zeno's story with my photos! "When I was in high school, I found that dead-end street named after my great-grandfather quite by accident. That was a moment I won't forget. "My great-grandfather loved that piece of land because the river ran through it. Zeno's wife died in the flu epidemic of 1918 and the land was later sold." And Alice Stanley, Yukon, wrote about the old Beverly's Chicken in the Rough restaurants, the last of which moved to a new location this month (column Jan. 22). It's always surprising how many of our memories are served with anecdotes of food and eating.
" In the very early 60s (I was in my very early 20s), I worked at the state Capitol. There was a fairly large Beverly's restaurant on Lincoln Boulevard just north of the Capitol building. We state employees were paid once a month, so on payday we would sometimes go to Beverly's as a special treat. "Judy, Ginger and I nearly fell out of the booth laughing." Three decades ago, Beverly's was The Place To Go. Almost any evening, and every Saturday night, we could find high school and college friends in the restaurant north of the State Capitol, plowing through Six-by-Six hamburgers and baskets of Chicken-in-the-Rough. It was more of an insitution than a restaurant. We met there after any kind of event, from a movie to a formal dance. We chased girls and made too much noise, and some will remember a few fights in the parking lot. Through it all, Beverly Osborne remained a loveable man who seemed to like us being there, noise and all. He had built that restaurant from nine stools in 1937 to 1,200 seats in the 1950s. Chicken-in-the-Rough was franchised nationally to more than 350 restaurants, and a local chain of eight restaurants was established. The chain was reduced to three in the 1960s and 70s because of leases lost to Urban Renewal. Randy Shaw, who had first joined Osborne in 1937, gained full control in 1978, about a year before Osborne's death. Now, Beverly's Restaurants are flowering once again in Oklahoma City, Chicken-in-the-Rough and all. The first new Beverly's in more than two decades has been opened in the new Stockyards Exchange Building. A grand opening is scheduled June 6, celebrating at the same time the 61st anniversary of Beverly's. Shaw and his sons, Randy Jr. and Jim, plan to open six more over the next six years. ""We were in a holding pattern until my sons were certain they wanted to go into the business,'' said Shaw. ""I wanted to be sure we could control the quality of the food and the restaurants under the Beverly's name. We are free of debt, and we were able to open the new restaurant in the Stockyards without borrowing from a bank. The franchise operation of Chicken-in-the-Rough shrank to 13 restaurants at one point, but that also is growing again in Chicago and Canada, said Shaw. That operation is owned separately by Jack Carroll, now of Chicago. Osborne was way ahead of his time with that idea. There were no computers to control payments by franchise holders when the franchising was started in 1937, the way chains such as McDonald's, Burger King, Wendy's and Chi-Chi's are controlled. How it all started is a yarn that deserves a permanent place in the folklore of Oklahoma City. Osborne, who had started out washing dishes for a restaurant in Marlow, opened his first Beverly's in 1921 at 209 W Grand, now Sheridan. He and his wife, Ruby, tried eight times to open additional restaurants, but couldn't supervise them. At one point, Beverly served turkey and cornbread dressing with cranberry sauce, a vegetable, salad, potatoe, dessert and a drink for 29 cents, said Shaw. In 1937, the way Shaw tells it, Osborne and his wife started out for California in a Model T Ford to get new restaurant ideas. They had a fried chicken lunch packed in a box. Eating the chicken was difficult in the bumpy old Ford, and pieces of chicken would bouncout of the box. ""This is really eating chicken-in-the-rough,'' said Ruby...or words to that effect, according to Shaw. The expression rang in their ears, and by time they returned to Oklahoma City they had planned how they would serve it. The idea was to convince people, they figured, that the best way to each chicken was with the fingers. So they would serve half a fried chicken on a platter with shoe string potatoes, hot rolls and honey with no silverware. It was a smash success, as everyone knows, and then came the logistics. To cook the chicken faster and better, Osborne worked with a local firm to develop a ""Chicken-in-the-Rough'' grill, four feet long and 24 inches wide with a fold-over top. When local restaurant operators asked to serve it, Osborne had the Chicken-in-the-Rough trademark copyrighted and the grill patented. With that, the way was cleared for the cigar-smoking rooster with a golf bag and broken club, searching for a ball in the rough, to reach national fame. Shaw, who also was from Marlow, joined Osborne that year as a waiter. He became manager of the downtown restaurant until he went in the service during World War II. After the war, Shaw helped Osborne expand the chain to eight restaurants. ""We never had to close a restaurant because it wasn't making money,'' said Shaw. ""We lost five sites to Urban Renewal. I have always maintained that the Six-by-Six Hamburger was an ancestor of current national models such the Whopper and the Bic Mac. ""R. G. Miller, who used to write the Smoking Room column in the Oklahoma City Times, wondered once why no one made a big hamburger,'' said Shaw. ""So we came up with a hamburger with six ounces of meat and a bun six inches in diamter, and called it Six-by-Six. During the last two decades, the restaurant business has been flooded by the national chains in fast food and family dining. However, Shaw says Beverly's sales have been consistent, with dollar volume and profits rising along with inflation. The two long standing restaurants at NW 23rd and Classen and on the Northwest Expressway combined to average about $2 million a year in sales, he said. The new Stockyards Exchange restaurant provides interesting new possibilities. ""We have the opportunity set up tables in the covered courtyard, possibly for something like a 4 p.m. English tea time dessert,'' said Shaw. ""We will use the courtyard for our grand opening.